7 reasons you should upgrade that old hard drive to an SSD today! 1 Comment on 7 reasons you should upgrade that old hard drive to an SSD today! With computers, as with all tech, advancements move quickly. So why are you still rocking that old spinning hard drive (HDD) instead of a shiny new SSD? My friend, are you a glutton for punishment? Maybe you just don’t know what a solid state drive (SSD) is or how it can benefit you? Worry not Souper Friend, you’ve come to the right place! I’ve got 7 great examples of how an SSD will enhance your computing life! The hard disk drive (HDD) was created in 1956 by Rey Johnson when he was working for International Business Machines (IBM). This 3.75MB drive housed 50 platters that were 24” wide and was the size of a couple commercial refrigerators. You would be able to store a single MP3 file on this original HDD. Clearly they’ve made huge advances in size and efficiency. 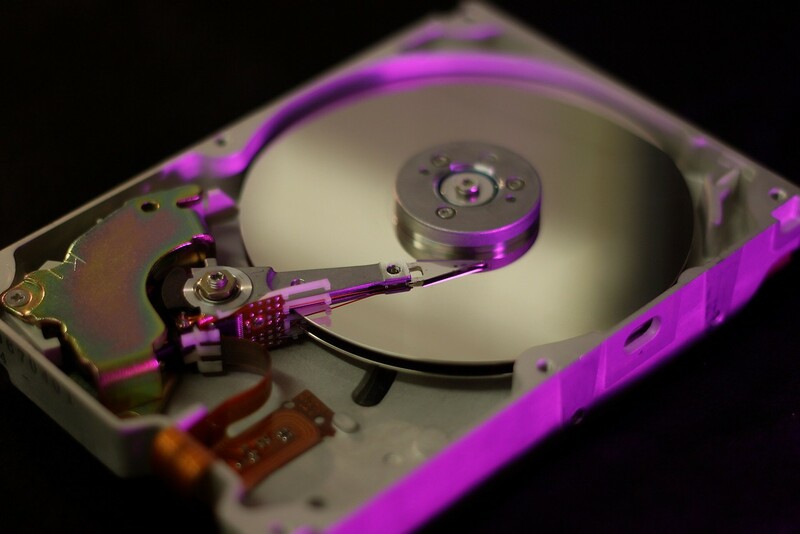 An HDD is made up of two components, magnetic platters and an actuator arm. The platters are divided into a billion tiny areas that can be independently magnetized with the 0’s and 1’s. The actuator arm moves across the platter writing those bytes as the platter spins. It’s kind of like a record player on steroids that both plays and records music to the vinyl at the same time. Typical drives spin at several different speeds, or Revolutions Per Minute (RPM), including 5400, 7200 and 15,000. As you can imagine, the faster the platters spin the faster the drive reads and writes data. 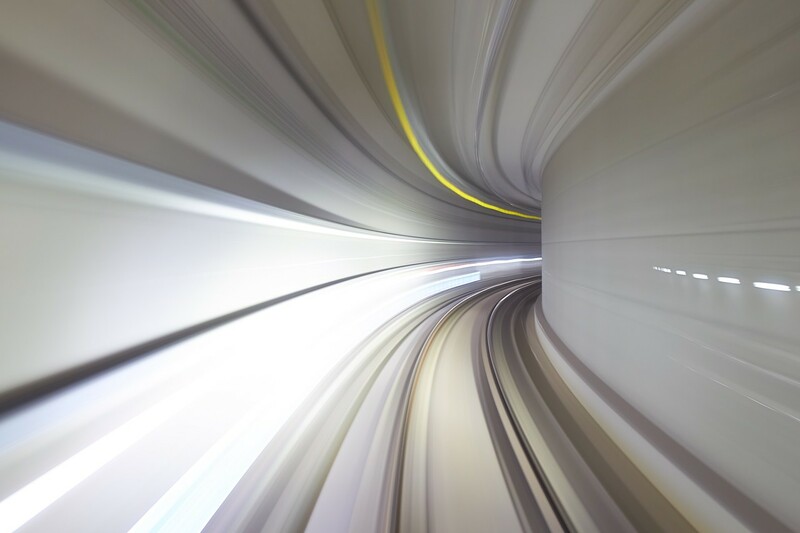 Fast equals better computer performance. First is durability. Because an HDD has moving parts (platters and actuator arm) they wear out over time. Also, a hard bump to the PC could cause the actuator arm to drive into the platters, causing permanent damage. Yep, again, just like the needle of the record player scratching across your prized vinyl! Next is disk fragmentation. Disk fragment-what-now? On a clean drive, as you write data it places it end to end as you fill up the drive. Think of how organized your sock drawer is on laundry day, all stacked nicely in neat rows. As you erase files, or use the drive, it leaves openings in those nicely organized rows, which is filled with new data. If the space that was vacated when you delete files isn’t big enough to house the entire new data file it will break it up, placing it in different vacated sections. Those individual socks get mismatched and begin to look like a chaotic mess quickly. As you can imagine, with time all those files get spread out in dozens of places all over the platters. Simply put, that orderly organization that was easy to access now sees that actuator arm jumping all over the platter, or platters, just to read that single file. Let the slow down begin, it’s hard to find a matching pair of socks in all that mess! There are tools to fix this, a digital maid to clean up and organize the drive, via software (either what’s built into the OS or third party). 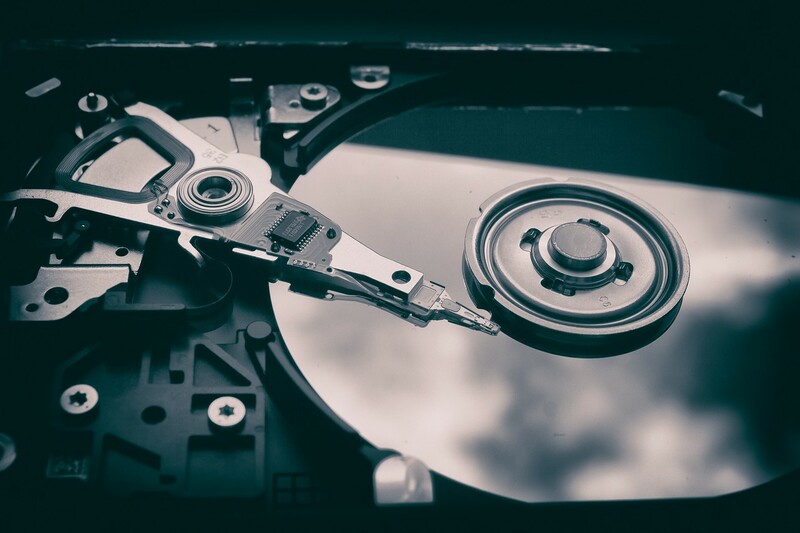 You’ve probably seen or heard of the process of defragmenting the disk? Disk defragmenting puts all the parts of the file in sequence by re-writing the entire drive. But, depending on the level of fragmentation and the speed of the drive it could take days. Don’t forget – Moving parts also means noise. Since an HDD has moving parts it does generate noise. You can hear the platters spin up and down and hear the actuator arm reading or writing data. Lastly, power consumption. Let’s not forget that anything that moves takes power to do so. A standard HDD will cost more power to operate than you may realize. SSD = Souper Spectacular Device! SSDs to the rescue! There are so many advantages to solid state drives that many a casual computer user may not know. Let’s break it down now! First and foremost, SSDs are fast. Since they have no moving parts reading and writing is almost instant. Therefore, it is recommended that the operating system and all most used apps should be stored on the SSD first, with data files being relegated to the slower HDD. Placing your operating system on an SSD and those normal minute to two-minute boot times drop to about 25 seconds. Shutdown is even faster! Second, silence is golden. Since there are no moving parts it is completely quiet and generates nearly no heat. Therefore, they are great for laptops since it is always a battle with thermals in those small enclosures. Not to mention, if you are using your laptop in a library you won’t be annoying people with an actuator arm moving across the platters. Lastly, no more power hogs! The absence of moving parts means power draw is very minimal. Okay, sounds great…what’s the catch? SSD’s do have a finite amount of read and write cycles but you probably won’t kill one in the life of your PC. Most SSD’s will withstand heavy use, so unless you are writing gigabytes of data every day you should be just fine. By nature, they don’t become fragmented per se , but if you do delete data you do need to trim the drive for top performance. Umm, trim the drive? When you delete on an SSD the data remains on the drive physically until new data gets written. When the machine writes new data to a block that previously had data on it, it erases the block and then writes the new data on the fly. This still blows away the speed of an HDD but it does slow the process down. When your run the trim command on the SSD it goes in and permanently deletes the unused data in that block. When new data needs to be written it only has one step to do. AHH! Trimming the SSD is like getting daily exercise, it just keeps things operating at peak performance. Now the biggest downfall for SSD’s is price, they are much more expensive than an HDD per gigabyte. An SSD is about $0.49 per gigabyte where a HDD is about $0.04. That is why for mass storage you still need that HDD in your system. Whew, did you catch all of that? Need a quick recap? DONE! SSD’s are faster, quieter, more durable and less power hungry than a standard HDD. Thus, your computer experience is enhanced greatly. SSD’s are a bit more expensive, so you will still need those large volume HDD’s around to take care of your mass storage needs. Though, as time goes on prices on SSD’s continue to drop, which means more speed and storage at a friendlier price. I want to end this article by saying that in 2018 there is no reason why your operating system should be running on an HDD unless you just love frustration and have all the time in the world. 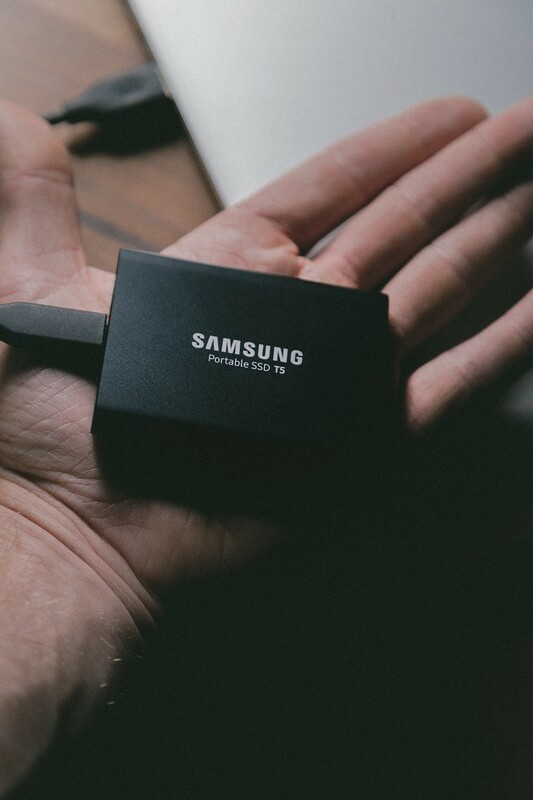 With an SSD you will get more work done and even your everyday tasks will be completed faster. If you are a listener of digitalSoup then you’re probably already running one. But, if not OR if you have friends and family still holding out, please link them this article. We want to help them eliminate some of their slow computer frustrations! If you have questions reach out to us by hitting that “CONTACT ME” button up above! Now go love your SSDs!